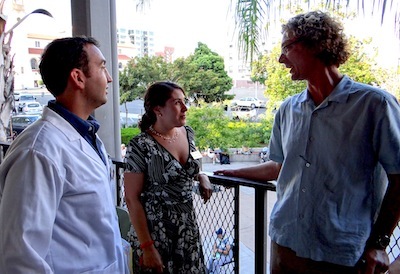 The Downtown San Diego site of the Community Law Project is part of a unique Medical-Legal Collaboration with UCSD. The First Lutheran Church provides free space for the collaborating agencies. Third Avenue Charitable Organization, a program of the church, also provides congregate meals to those in need prior to the provision of clinic services. The City Heights sites of the Community Law Project opened in 2009 with the support and assistance of Price Philanthropies and San Diego State University School of Social Work. One on one legal assistance is available at both Hoover High School and Rosa Parks Elementary School. Regular community education presentations take place at Monroe Clark Middle School. Staff at these sites collaborate with the schools' social workers, as well as with staff at the schools' parent centers. The City Heights sites of the the Community Law Project are proud to be part of the City Heights Educational Collaborative, whose mission it is to improve educational outcomes for students within the City Heights neighborhood of San Diego. Although the City Heights clinics mainly cater to those residing within the City Heights community, all of the clinics and presentations are open to the community. Hoover High School’s student body of approximately 2,200 students is rich in cultural diversity with a majority of Hispanic students, 40 percent English Learners, and about two-thirds of our students come from homes where a language other than English is spoken. Hoover High part of the City Heights Educational Collaborative, a partnership with San Diego State University, the Price Foundation, Clark Middle School, and Rosa Parks Elementary. All Hoover students are eligible for guaranteed admission to SDSU through College Avenue Compact. Monroe Clark Middle School's mission is to help students become resourceful, independent learners who possess the ability to master state standards. It has focused its efforts as well on strengthening attendance, to keep students and their families focused on what really matters. Clark School students continue to improve their achievement levels. Its community has become a more stable and safe neighborhood. Monroe Clark is the school to watch! Rosa Parks Elementary School is located in the Mid City/City Heights area. Its motto is "Doing our best so we can be the best." It provides standards-based education for all students. Staff, parents, community, and educational partners of Rosa Parks are committed to a quality education for all students. It is a member of the City Heights Educational Collaborative, an innovative educational initiative that partners three District schools in City Heights with San Diego State University School of Education, San Diego Education Association and Price Charities. The Solana Beach site of the Community Law Project aims to bring our services closer to those who reside in North County. California Western School of Law has partnered with St. Leo Mission Church to host a monthly legal clinic. Many families served at the North County site receive additional services at the church, including medical and dental care. St. Leo Mission Church is part of St. James Church, a Catholic Community in Solana Beach. The Mid-City clinic partners with organizations who work to serve refugee and immigrant populations in the Mid-City/City Heights area. These partners provide a space for our clinics as well as critical interpretation assistance. Partners include PANA, Partnership for the Advancement of New Americans, San Diego www.panasd.org and the Karen Organization, http://karensandiego.org/. We also participate in the Crawford Collaborative and the San Diego Refugee Forum in order to reach and respond to community needs.